Create responsive and intelligent game AI using Blueprints in Unreal Engine 4 About This Book * Understand and apply your Game AI better through various projects such as adding randomness and probability, and introducing movement * Configure and debug Game AI logic using multiple methodologies * Bridge the gap between your knowledge and Game AI in Unreal Engine 4 Who This Book Is For This book is for programmers and artists who want to expand their knowledge of Game AI in relation to Unreal Engine 4. 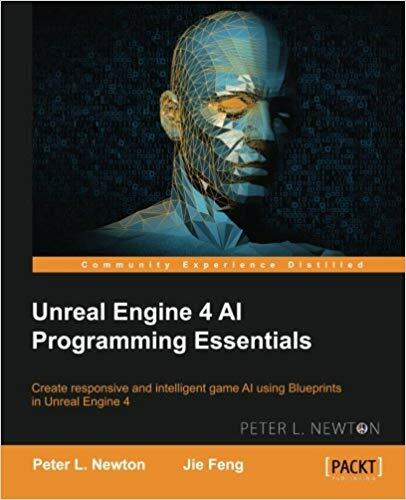 You are recommended to have some experience of exploring Unreal Engine 4 prior to this book because we jump straight into Game AI. What You Will Learn * Understand the fundamental components of Game AI within Unreal Engine 4 * Skillfully introduce Game AI within Unreal Engine 4 * Configure, customize, and assign Navigation and AI components to your pawn * Create, debug, and analyze Game AI behavior * Design responsive Game AI using the Behavior Tree methodology * Create smart objects designed to interact with AI * Utilize advanced AI features within your project to maximize the user experience In Detail Unreal Engine is a powerful game development engine that provides rich functionalities to create 2D and 3D games. Developers have the opportunity to build cross-platform mobile and desktop games from scratch. This book will show you how to apply artificial intelligence (AI) techniques to your Unreal project using blueprints as your scripting language. You will start with an introduction to AI, and learn how it is applied to gaming. Then you'll jump right in and create a simple AI bot and apply basic behaviors to allow it to move randomly. As you progress, you'll find out how to implement randomness and probability traits. Using NavMesh, you will impart navigation components such as character movement, MoveTo nodes, settings, and world objects, and implement Behavior Trees. At the end of the book, you will troubleshoot any issues that might crop up while building the game. Style and approach This easy-to-follow project-based guide throws you directly into the excitement of Game AI in an approachable and comprehensive manner.